Film stills from Waltz with Bashir. Credit: Ari Folman and David Polonsky/Sony Pictures Classics. 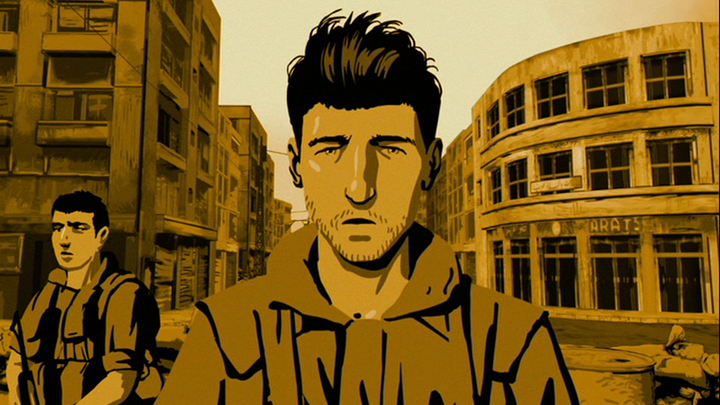 Ari Folman’s 2008 animated documentary Waltz with Bashir is a genuinely remarkable film. Through its innovative use of animation, this film offers an illuminating treatment of the relationship between history and memory, while at the same time ingeniously reenacting and even enlarging the experience of witnessing. That being said, the film’s profound closing moments also have the effect of foregrounding Israeli passivity in regards to the events it represents. This matter of passivity should raise concern since it resonates with the place Sabra and Shatila occupies in Israeli collective memory of the First Lebanon War. The climax of Waltz with Bashirz comes only a minute before its conclusion. This climax arrives not by way of dramatic action per se, but rather through a last instance of recovery. Folman, the filmmaker/protagonist, finally recalls his experience of the massacre in Palestinian refugee camps of Sabra and Shatila, which took place more than twenty years earlier. The film’s entire trajectory has been the steady uncovering of a vast network of repressed or lost memories, a network tracing out Folman’s experience of the First Lebanon War. The narrative steadily illuminates this network, giving the film a simultaneous spatial and temporal vector: Folman, he relearns, entered Lebanon at the start of the war in June 1982 and traveled north into Beirut, just before the massacre in September. A travelogue is reconstructed, each of its different stations newly revealed under the light of active recollection. Folman employs his film’s central technique, that of animation, to investigate the rich, real-imagined tension that lies at the movie’s core. Waltz with Bashir revolves around a particular historical moment, and is thus interested in an actual past, but the film is much more concerned with subjective encounters and echoes of this history, that is, with visions, dreams, flashbacks, hallucinations, and the mechanism of repression. In other words, this is less a film about a war or a massacre than it is a treatment of what happens to a historical event once it becomes a memory, a trauma, or a repression gradually returned. These variously disorienting transformations motivate the film’s masterful and creative use of animation, which is consistently employed to represent both the surreal qualities of war itself and the thin, permeable border separating the external, the actual, and the comprehensible from the internal, the imagined, and the inscrutable. The film’s last, powerful gesture—the sudden switch from the animation of Folman’s flashback to actual footage of the Sabra and Shatila refugee camps immediately following the massacre—signals more than just a final act of remembering. This profoundly unsettling shift drives a wedge between the real and the imagined, unequivocally separating the two and privileging the former over the latter. In this moment, the various mutations and warpings of individual memory—the void of repression, the semifigurative realm of the nightmare, the nearly mythic logic of the flashback—are neutralized, reversed, and utterly undone. The shocking clarity of the final recovered memory marks Folman’s reunion with the horror of the actual event. The moment he finally remembers his experience of the massacre, the viewer is removed from the stylized world of animation in order to confront up close the immediate aftermath of the slaughter: women overwhelmed with grief, piles of bloody, bullet-ridden corpses, and the closing image of a murdered child mostly buried under rubble recently created in a hurried effort to conceal the killings. Folman elevates the veracity of this footage by placing it at the end of eighty minutes of stylized drawings. Moreover, the viewer sees these closing images through Folman’s eyes. The final moment of animation shows us the younger Folman facing a large crowd of Palestinian women rushing toward him. We have seen this image more than once before in the film, it is the last moment of his recurring flashback, in which he, along with two other Israeli soldiers, exit the sea naked, put on their uniforms, and enter the streets of Beirut. The film’s denouement belatedly provides both Folman and the viewer with the conclusion missing from the protagonist’s abruptly ending flashback, a conclusion that is also an act of witnessing, of confronting the aftermath of an atrocity. When Folman finally remembers, the viewer is finally allowed or forced to see as well. And we see it as Folman saw it (or as he sees it again), since the viewer’s position in the scene suddenly flips one hundred and eighty degrees: we are transported from a head-on drawing of Folman’s upper body to his view of the massacre itself. Folman shifts from object to subject, while the viewer moves from his or her position opposite Folman to inside Folman himself. Overall, then, Waltz with Bashir stages the experience of witnessing in such a way as to force the viewer to experience it as well, in order to sense the profound shock of the initial encounter with an atrocity. Folman essentially relives the original experience of witnessing following the twenty-plus years of his repression, while the viewer, through the shift from animation to real footage and the shift from outside to inside Folman, is struck with something approaching the power of the actual witness’ encounter, even if we, like Folman himself twenty years later, already knew in general what had happened. As Folman becomes a witness once more, the viewer becomes a seemingly qualified proxy or secondary witness, one arguably capable of bearing witness to this experience as well. With all this in mind, we can say that Waltz with Bashir is a highly successful movie, not so much aesthetically, or not only aesthetically, but as a film that simultaneously reestablishes the identity of an original witness and manufactures, by the thousands, additional proxy witnesses. If bearing witness to an atrocity constitutes a moral act, then Waltz with Bashir ought to be understood as a film possessing unusual moral force. Nevertheless, the film’s central achievement comes at a cost, since our transformation from regular moviegoers to witnesses parallels a transformation undergone by Folman himself. At the time of the war, Folman’s identity, beyond that of a young Israeli soldier, is not clear. On the one hand, he is an active member of an invading army. On the other hand, he is a comparatively powerless soldier sent into a war whose highly dubious aims and justifications he’s ill-equipped to understand, let alone resist or reject. Folman’s position grows only cloudier as we move toward the massacre itself, since his spatial proximity to these killings must be weighed against the fact that the actual murderers are his Christian Phalangist allies. There is little question regarding the identities of the victim (the Palestinian refugees) and the victimizers (the Phalangists). But where are we to position a common Israeli soldier like Folman? Prior to the very ending of the film, we encounter alternatives to the witness position he will ultimately settle upon. In particular, Folman acknowledges his membership in the units that not only sealed off the camps, but also shot flares into the night sky and thus directly assisted the Phalangists in their around-the-clock killing. Similarly, in an earlier scene, a close friend suggests that immediately after the event the nineteen-year-old Folman did not conceive of any meaningful difference between the killers in the camp and the circles of Israeli soldiers who surrounded them. Nevertheless, the final moment of the film situates Folman at his most passive, reduced to eyes and ears, clearly distinguished from the murderers themselves. In other words, Folman the filmmaker ultimately positions Folman the soldier in a relatively inculpable light as he draws the viewer into the literal picture as a witness. This focus on the implicated witness resonates strongly with the dominant narrative of this war in Israel, a narrative in which Sabra and Shatila occupy a crucial position. Without minimizing the horror of the killings themselves, we ought to ask how it came to be that what many regard as a widely destructive war of choice is often synecdochically represented by a massacre perpetrated by a third party. Why is it that irresponsibility, denial, guilt by association, and a failure to intervene—all failings, but failings of a limited sort—are the primary charges Israelis hold against themselves for this war? How did Sabra and Shatila come to be seen as more important, and even morally worse, than, for instance, the siege of Beirut or the initial unilateral invasion? These questions are too great to be tackled here, since finding their answers would require, among other things, an investigation of the way Israeli discourse surrounding this war and this massacre first emerged a quarter-century ago. For now it seems safe to conclude that while Waltz with Bashir masterfully represents and recreates Ari Folman’s complex and ongoing experience of this event, it simultaneously reinforces the already dominant Israeli collective memory of this war, one importantly fixated on a moment of relative passivity. Todd Hasak-Lowy is an independent scholar, writer, and translator living in Evanston, IL. He is the author of three books of fiction and an academic monograph, Here and Now: History, Nationalism, and Realism in Modern Hebrew Fiction (Syracuse University Press, 2008). His translation of Asaf Schurr's novel Motti won the 2013 Risa Domb/Porjes Hebrew-English Translation Prize. His first young adult novel will be published in 2015. Todd teaches creative writing and literature at the School of the Art Institute of Chicago.